Much like other armies at the time, the U.S. Army envisioned two main roles for tanks: infantry support and breakthrough exploitation. From 1942 until the end of World War II, both roles were covered in the main by the M4 Sherman, which was better suited for the latter "cavalry" role. The infantry would have preferred a better protected and better armed vehicle, even at a price of less mobility. In late 1942, U.S. Army Ordnance started to work on an "infantry-oriented" design which was supposed to be more versatile than the British infantry tanks. During the next two years, various prototypes were built under the designations T20, T22, T23, T25 and T26. These covered a variety of combinations of weapons, transmissions, and suspensions. However, the initial success of the M4 led the Army Ground Forces command (AGF) to believe that there was no urgent need for a new tank. Even with the appearance of the heavy Tiger and medium Panther tanks, the AGF did not alter its position, believing both tanks would be fielded in relatively small numbers. The AGF was correct about the Tiger, a specialized heavy tank that was never encountered in large numbers. The Panther, first encountered in small numbers at Anzio, however, was produced in very large numbers and formed half the German tank strength in Normandy. Also, according to the Army doctrine of the time, tanks were not supposed to engage other tanks; this was the task of tank destroyers, more mobile armored vehicles with powerful guns, such as the M10 tank destroyer. As a result, the development of the new tank was slow. When the Allies invaded western Europe during Operation Overlord in June 1944, the M4 still equipped the bulk of American tank units. It quickly became clear that the tank destroyer doctrine failed in the field and that even the upgunned Sherman was unable to engage the Panther on equal terms. Efforts were made to speed up development but the tank, by now called the T26 and dubbed the Pershing, reached the battlefield only in February 1945 and saw very little action in World War II. In May 1946, due to changing conceptions of the US Army's tank needs, the M26 was reclassified as a medium tank. Designed as a heavy tank, the Pershing was a significant upgrade from the M4 Sherman in terms of firepower and protection. On the other hand, its mobility was unsatisfactory for a medium tank (it used the same engine that powered the M4A3, which was some ten tons lighter) and its transmission was somewhat unreliable. In 1948, the M26E2 version was developed with a new powerpack. Eventually the new version was redesignated the M46 General Patton and 1,160 M26s were rebuilt to this new standard. Thus the M26 became a base of the Patton tank series, which replaced it in early 1950s. The M47 Patton was an M46 Patton with a new turret. The later M48 Patton and M60 Patton, which saw service in later Vietnam and Mideast conflicts and still serve in active duty in many nations today, were evolutionary redesigns of the original layout set down by the Pershing. This is one of Cyber-hobby's Super Value Pack kits. Basically, it is an older kit, sometimes with upgrades and with a figure set added in. This one has set 6149: US Anti-Tank Team along with another sprue that includes a flame thrower and bazooka. Very nice addition, though perhaps it would be more useful with a Panther tank kit, eh? 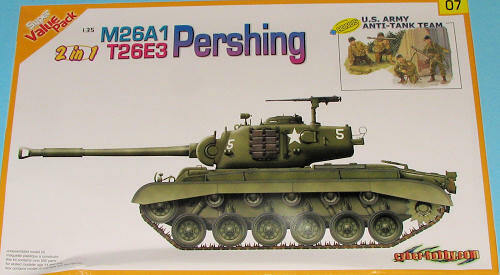 Allow me to state that I've no idea on how accurate this Pershing kit is. It looks just fine to me, but I'm not an armor expert. I can tell you that the kit provides the alternate bits that are needed to do either a very late WWII T26E3 or a Korean War M26A1. You'll note from the parts layout that there are no photo etch parts included. There is nothing on the interior of the kit, not even the gun breech so no worries about building in details you won't see. What does seem to be added to this kit are the DS tracks for the M26A1. 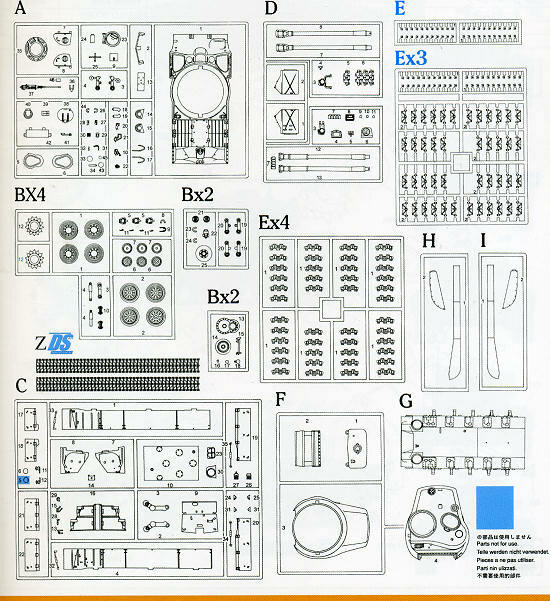 Though the parts layout shows individual links for this version, they are not in the kit. What is in the kit are the links for the T26E3. This accounts for quite a few of the over 500 parts that are in the box. Even with the DS tracks you have to glue on the individual tra ck guides. 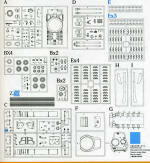 A few parts also need to be trimmed, but that is shown in the instructions. These instructions are like all the other Value Pack instructions. They are the smaller, full color ones. Markings are provided for eight different Olive Drab tanks. Two of them are WWII T26E3s from the 3rd and the 9th Armored regiment in the last months of the war. The rest of them are all Korean War tanks. White 5 is US Army Chosin Reservoir in 1950, D1 is Marine 1st Tank Battalion at Cochon-dong in 1951, white 3 is the same unit in 1950, location not mentioned. Then there is a white 4 alos with this unit. Another white 3 is US Army in 1950 and the last tank, B12 is with the Marine 1st Tank Battalion at the Han River in 1950. 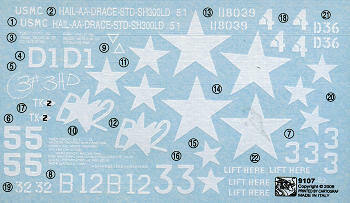 The decal sheet is quite nicely printed and while not full of color, is adequate for the job. These Value Pack kits have been selling very well at the local hobby shop. They provide a lot of kit for less money and add in the figure set, which is a particularly nice touch. This kit has the bonus of the DS tracks if doing a Korean War version, cutting back on all the work required for the individual links. Yet if you want a late WWII Pershing and the added detail of individual links, you have that option as well.